Man traveling in a skin boat with motor. Paul John noted: "Skin boats were almost round. They used them when they came down the rapids, as round boats did not easily capsize." Ilateng qaillun pillrunrilkan, unguviimeng tamarmeng, nutaan nunanun igvaqataameng nuteteng teguluki, tua-i llu igvaameng tua-i nunanun, nut'galuteng, "Pecuw." Amkut-llu ciunrit cali akiurluteng. Taugken ilaseng qaill' pillrukan nutegngaunateng taukut-llu ciunrit taringarrluteng, kankut-am caciitenritliniut. If nothing had happened to anyone in their group, since they were all alive, when they got near their village they'd take their guns, and just when they could see the village they would start shooting, "Pecuw!" And the villagers would reply with shots, too. But if something had happened to one of them they wouldn't shoot, and the people in the village would understand that something bad had happened to one of them. 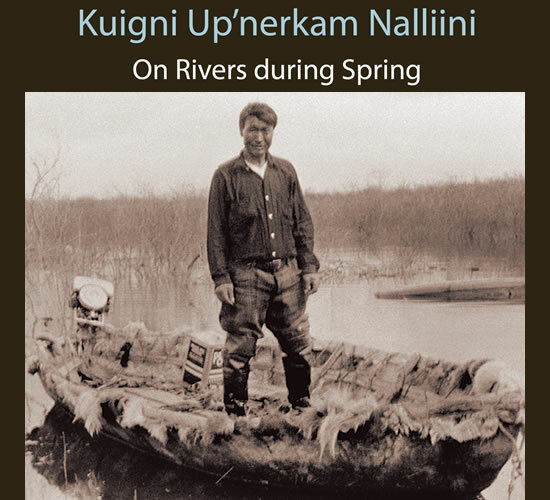 As days grew longer in late March and early April along the Kuskokwim, hunters traveled up the river's fast moving tributaries including the Kwethluk, Kisaralik, and Aniak rivers to headwater lakes and streams. They traveled by dog sled, following overland trails into the Kilbuck and Kuskokwim mountains. While coastal people focused on sea mammal hunting, these families remained in the mountains until May when the rivers were ice-free, trapping squirrels and hunting for moose, bear, and caribou before returning home for summer fishing in raftlike boats made for one-time use on the downriver journey.